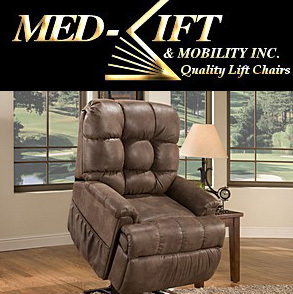 At Med-Lift and Mobility, our goal is to provide our customers with the most reliable lift chairs and adjustable beds available. We are continuously researching methods and materials that will allow us to manufacture products that require less maintenance and provide more years of service. We have had extensive testing performed on our wood frames by an independent furniture testing facility to insure long life and dependability. Med-Lift and Mobility, Inc. started manufacturing quality lift chairs in January of 1990 and over the last 19 years has become number one in the world when it comes to quality and customer service. Med-Lift sets the standards in the industry. Med-Lift has a large product line of lift chair models, each available in a large selection of luxurious fabrics and options. We are the only lift chair manufacturer to offer the Crypton fabric upgrade. Many of our models are available in different sizes, allowing you to be comfortable regardless of your height or weight. Some of the features we offer are three position recline, low voltage / Quiet motors with battery back-up, wall-a-way models, and our exclusive Ultra-Ezz III Miracle Motion massage system. We are also the only lift chair manufacturer to use the Acella Flex foam seating configuration and Uni-Construction seat and back frame design. Every chair comes with the best warranty offered by any lift chair manufacturer. Med-Lift , through our Sleep Ezz division also manufactures the highest quality adjustable beds in the industry with a weight capacity of up to 600 pounds. Every bed we manufacture comes standard with a LIFETIME warranty on the steel frame and a five year parts and labor warranty, that cover the motors and hand control. Get the best sleep possible by choosing the mattress that's right for you from our large selection of mattresses and make sure your body is stress-free by selecting the addition of the Ultra-Ezz III Miracle Motion massage.